Author and entomologist Clifford P. Ohmart brings reason and clarity to the politically loaded and amorphously defined popular world of sustainable viticulture with this unique and comprehensive examination of the subject. 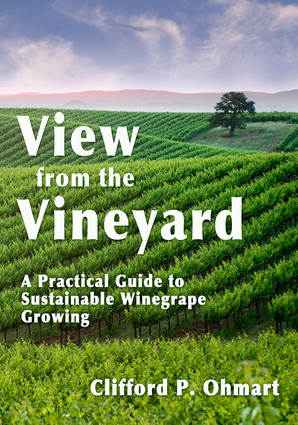 View from the Vineyard does much more than explain what "sustainable" means, its practical importance to the wine industry, and the costs of agribusiness as usual. It provides the farmer with a realistic and achievable path to a sustainable vineyard by describing the challenges of practicing sustainable winegrowing, where integrated pest management fits in, how organic and sustainable farming related, a holistic vision for the farm, how to identify and define your farm's resources, methods for developing sustainable goals, creating a plan to achieve your holistic vision, ecosystem management, and understanding the vineyard as habitat. The book concludes with a self-assessment guide in which growers can easily track their progress through these transitional periods. Clifford P. Ohmart is the author of the Lodi-Winegrower s Workbook and coeditor and coauthor of the Code of Sustainable Winegrowing Practices Self-Assessment Workbook. He writes a bimonthly column on sustainable winegrowing for Wines & Vines magazine; has authored 34 peer-reviewed research papers in international science journals; and presented more than 300 seminars, conference papers, and symposia papers at universities, government research organizations, and grower groups throughout the world.